The Felsenreitschule is a unique theatre in Salzburg and incorporated into the Haus für Mozart, the former Kleines Festspielhaus (Small Festival Hall). It is based on the old Baroque stables of the cavalry of Salzburg′s Prince Archbishop and was carved into the mountain of Mönchsberg. It was built at the site of a quarry where stone for the construction of the Salzburger Dom cathedral was mined in the early 17th century. In 1693, Prince Archbishop Johann Ernst Thun hired the Baroque star-architect Johann Bernhard Fischer von Erlach to plan the new Court Stables at this site. Fischer von Erlach, who also designed the Austrian Imperial Palace in Schönbrunn, had a unique set of arcades carved into the former quarry; 96 arcades, to be precise, spread over three floors. Initially, the facility was used for what the initial intention was: As a stable. Note the Pferdeschwemme nearby, the elaborate horse well. Horses surely were important at Baroque courts, not only for their use in the military, but also as objects of prestige and symbols of wealth and power. The Felsenreitschule or "Rock riding school" allowed visitors to enjoy the most beautiful horses in their training sessions. After the secularisation of Salzburg, the stables were used as storage facilities and otherwise; only with the foundation of the Salzburg Festival in the 1920ies, the Felsenreitschule entered a second life. The main co-founder of the Salzburg Festival was Max Reinhardt. He was also the first person to use the Felsenreitschule as a stage in 1926. The audience immediately loved the facility, as it matches well with Reinhardt′s approach of elaborate, Baroque celebrations of theatre. In 1933, the famous Austrian architect Clemes Holzmeister created the stage setting for a production of Faust. 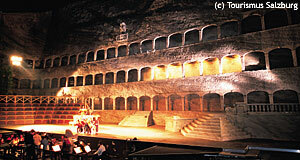 The production became legendary and made the Felsenreitschule the most famous venue of Salzburg. Another legendary moment in the life of the Felsenreitschule came in 1948, when the conductor Herbert von Karajan for the first time ever performed an opera here (Gluck′s "Orfeo ed Euridice"). In 1969, the whole of the Kleines Festspielhaus / Felsenreitschule ensemble was re-developed, the architect in charge was once again Clemes Holzmeister. New stages were installed alongside with a roof that can be removed on warm summer evenings. Especially for the "Magic Fluit", this creates an effect unseen at any other theatre in the world. The entrance hall′s 1930ies frescoes by Anton Faistauer, which had been removed by the Nazis, were re-installed. Today, the Felsenreitschule is one of the three major stages of the Salzburg festival, alongside with the Großes Festspielhaus and recently added Haus für Mozart. It shares the entrance area, wardrobe and buffet facilities with the latter one. The Felsenreitschule provides space for almost 1,500 visitors.